Extending a warm welcome to travelers to the Steel City, Sheraton Pittsburgh Airport Hotel features modern accommodations, personalized amenities and a travel-friendly location. Positioned just seven miles away from Pittsburgh International Airport, it's easy to arrive at our hotel via a complimentary shuttle service. Once you've checked in, a restful night's sleep awaits in our contemporary guest rooms and suites, replete with our plush Sheraton Signature Sleep Experience Bed. 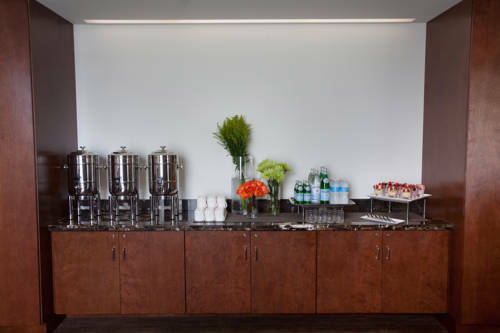 Awaken refreshed and ready to experience all that our hotel has to offer; all-day dining is available at Sheraton Caf & Bar or refuel with your favorite coffee beverage at our on-site Starbucks . Enhance your stay with a visit to our seasonal outdoor swimming pool, stay in shape in our 24-hour fitness center or handle last-minute meeting tasks in our Sheraton Club Lounge. Boasting an enviable location near the airport, our hotel is an excellent gathering point for business guests; enjoy 8,000 square of refurnished meeting space. Sheraton Caf & Bar: Begin your morning in Pittsburgh with a refreshing breakfast buffet, enjoy a light lunch or linger over a hearty dinner at Sheraton Caf & Bar. Located near Pittsburgh Airport, our signature restaurant is a must-visit before heading to the terminals. Starbucks Kiosk: Your favorite coffee beverage, savory pastries and light snacks are available at our hotel's Starbucks kiosk. Swing by before boarding a flight at Pittsburgh Airport. Sundry Shop: After touching down at PIT Airport head to our on-site Sundry Shop, which features grab-and-go style snacks, coffee, tea and other sundry essentials.